Yeah, brioche is what’s known as an enriched bread, which means it’s not just flour, yeast, water, and salt, but it’s also butter and eggs and milk or cream. The good stuff! But who cares, right? Toasted brioche slices with butter and honey or brioche french toast with maple syrup is the stuff that make life worth living. Too bad that finding good brioche is so tough. And don’t tell me they sell it at the grocery store in a plastic bag because if you take a look at the ingredients list, you’ll see that you’re eating high fructose corn syrup with some flour thrown in for texture. Well, guess what? 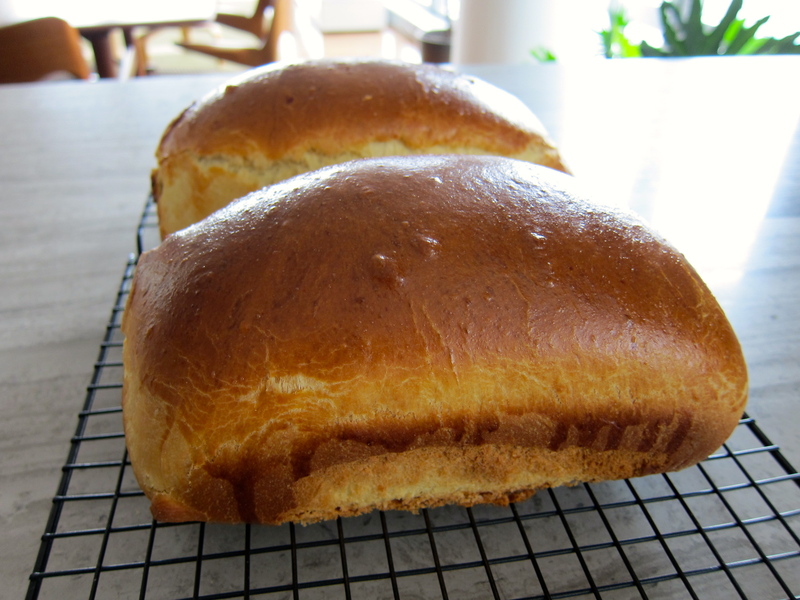 You can make your own brioche and it’s easy! Actually, it’s as easy as throwing stuff in a mixer, waiting, and folding a letter in thirds. No kneading and no fancy dough shaping. Making real brioche is tough. In The Bread Baker’s Apprentice: Mastering the Art of Extraordinary Bread by Peter Reinhart (one of the best books on bread making out there), there is a traditional recipe for brioche that takes two days and includes 2 cups of butter and 5 eggs for three brioche loaves. Yikes! 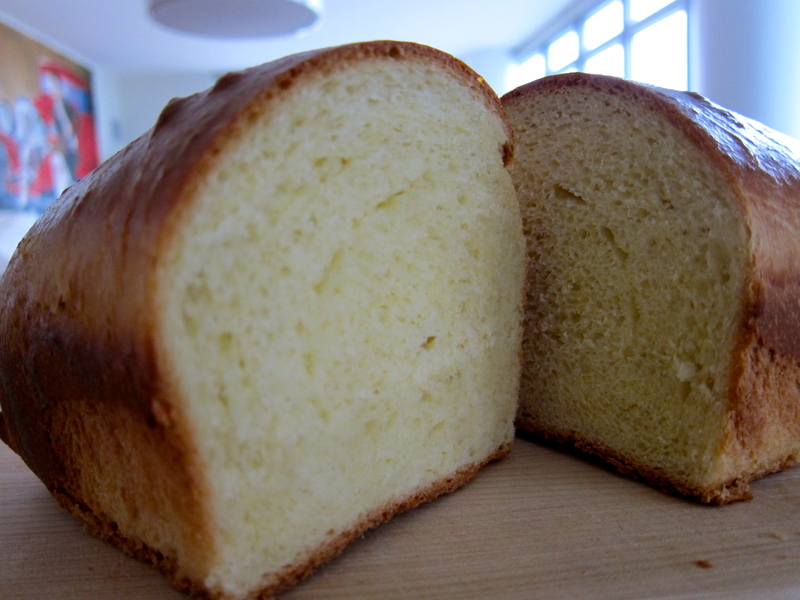 But he also provides a recipe for what he calls a “Poor Man’s Brioche” which takes only a few hours and includes just 1/2 cup of butter and 4 eggs for two brioche loaves. Yes, I said a few hours. I told you the recipe was easy. I didn’t say it was quick! But seriously, the vast majority of that time is just waiting for the dough to rise, so this is a perfect recipe for a lazy Sunday or a day off from work. I’ve adapted it here for you and I’ve included more detailed instructions so that even if you’ve never made bread or never baked anything, you can still do it. Lightly grease two 8.5 x 4.5 inch loaf pans. Dust with flour and shake out excess flour. Set aside. 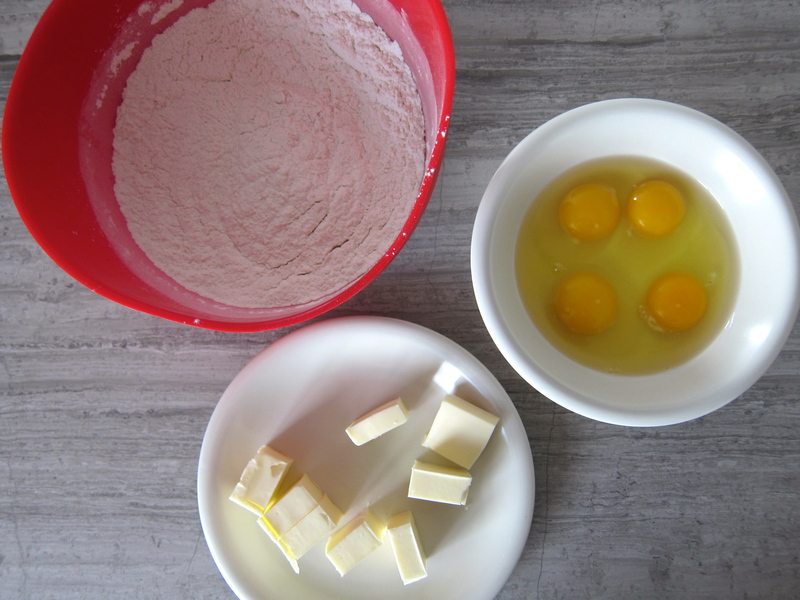 Add the four eggs to the risen sponge and whisk until everything is combined. 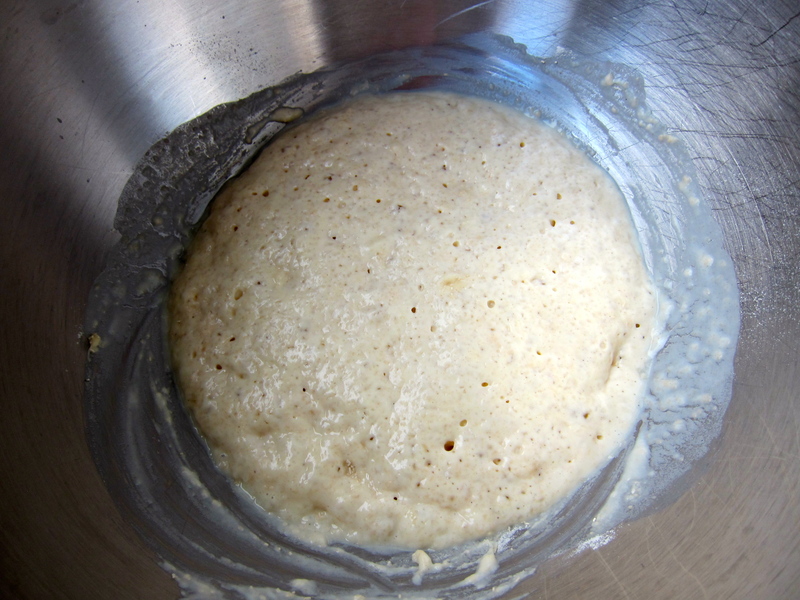 Put the bowl onto the mixer and use either the paddle or the dough hook. In a separate medium bowl, stir or whisk together the 3 1/4 cups of flour, sugar and salt. Add everything to the mixer bowl and mix at low speed for a couple of minutes until everything is combined. At this point you’ll have a dry and shaggy dough. That’s fine. Stop the mixer and let it rest for 5 minutes. If you were using the paddle, switch to the dough hook. Start the mixer again and add the butter two tablespoons at a time. Wait until the butter is completely mixed in before you add the next two tablespoons. Once all the butter is mixed in, increase the speed to medium low and mix for about 6 minutes, until you get a smooth dough that clears the sides and bottom of the bowl. 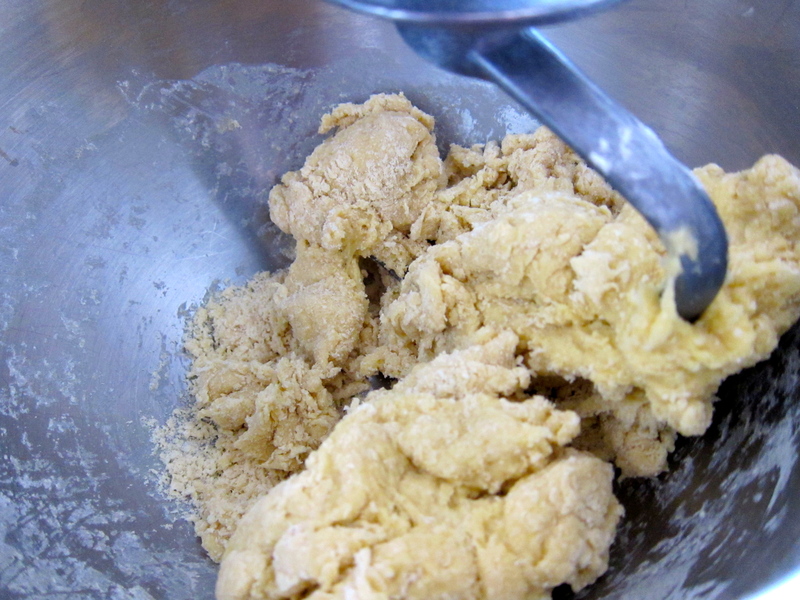 Take the dough out of the mixer bowl and put it in a lightly oiled bowl. Cover it with plastic wrap and let it rise for 90 minutes or until it doubles in size. Then comes the fun part. 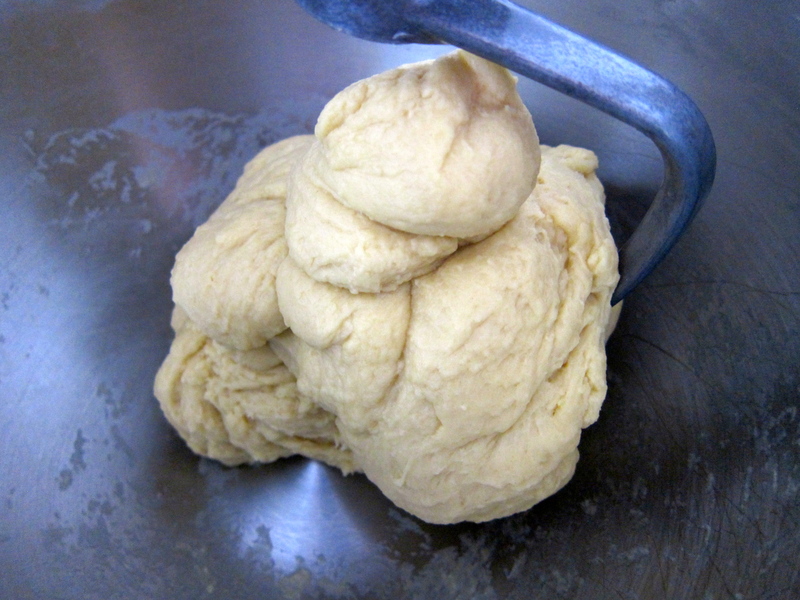 Take the risen dough out of the bowl and divide it into two equal pieces. Take one piece and place it on a lightly floured surface. Using your fingertips, pat it into a rectangle about 6 by 8 inches. Now, take the top and fold it halfway towards the bottom , like you would a letter. 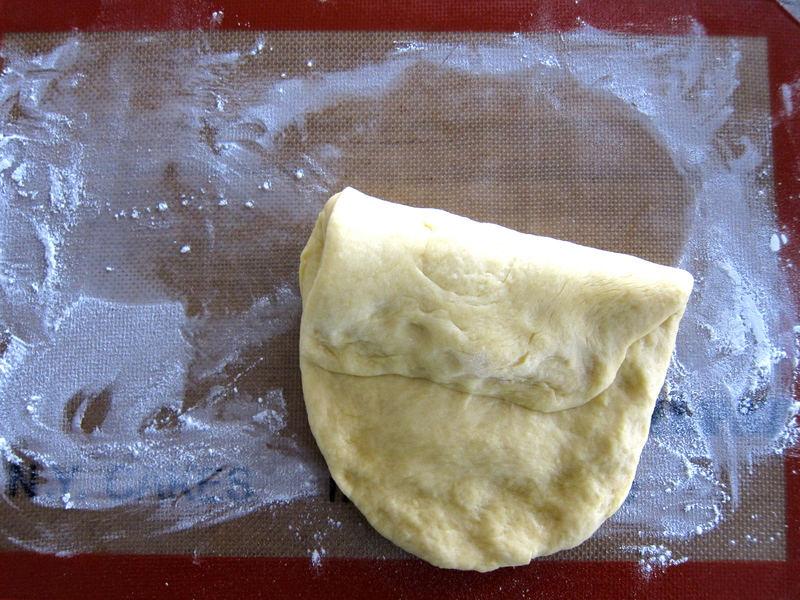 Use your fingertips to lightly press the edge into the dough. Now take the top edge again(the one that’s now double in thickness) and fold it down to meet the bottom edge. 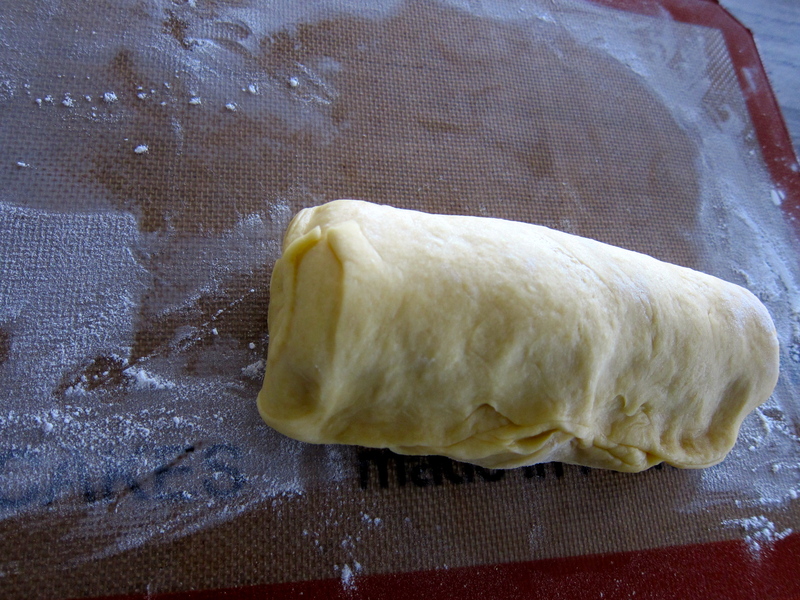 Use your fingertips again to press the dough edges together. That’s it. You can tuck in the side edges if you want but it’s not essential. 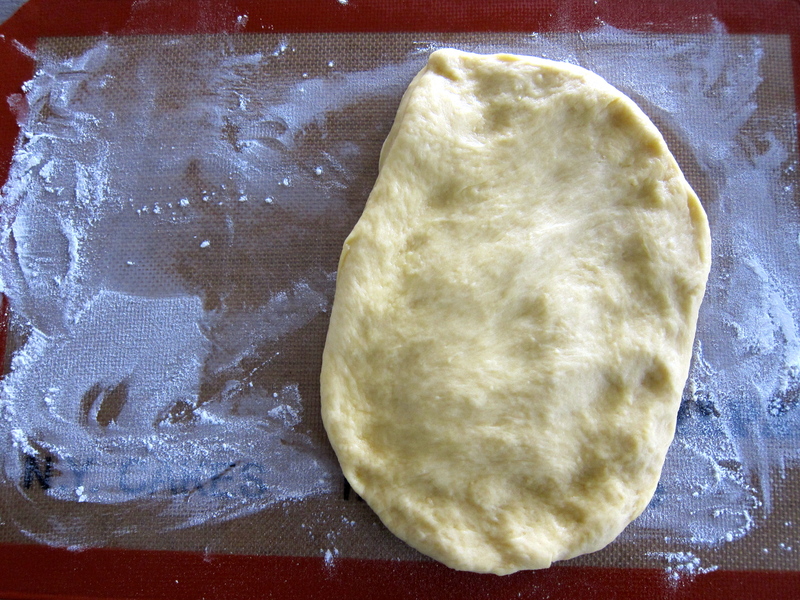 Place the dough, seam side down, into the loaf pan and repeat with the other half of the dough. You’ll probably notice that the dough doesn’t even come close to filling the pans. That’s ok. This dough will rise a lot. 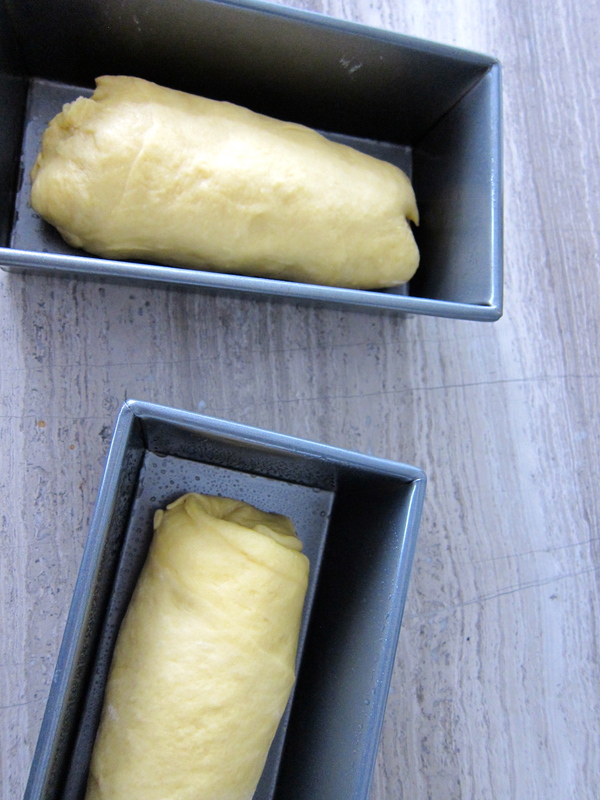 You want it to be much smaller than the loaf pans, otherwise it won’t have to room to rise. 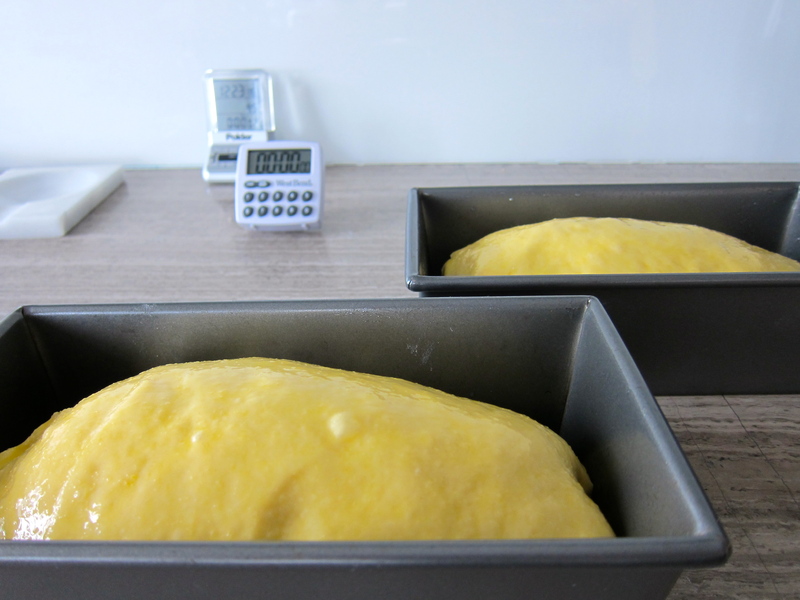 At this point, preheat your oven to 350° F. Cover the loaf pans with plastic wrap and let them rise for about 60-70 minutes until the dough comes just above the rim of the loaf pans. Brush the tops with the beaten egg wash.
Bake the two loaves for 35-40 minutes until the tops are dark golden brown. If you want to be really certain they’re done and you have a thermometer, you can stick it in the bottom of one of the loaves. If the internal temperature is above 190° F, they’re done. Let them cool in the pans for 15 minutes and then take them out and cool them completely on a rack. Brioche freezes very well. Wait until it’s completely cool, wrap it in tin foil and freeze it. When you want to have some, take it out and leave it on the countertop for at least 4 hours or overnight. This entry was posted in Recipes and tagged bread, brioche, recipe. Bookmark the permalink. Thanks Marios! I am eager to try this and make some French Toast for the kids, especially since I know it will be better than the store bought Brioche. Cool! Let me know how it went. Thanks for the recipe! I just made this and it turned out wonderfully. Made great french toast. I think there’s a typo in the recipe here though – you say “1/2 cup (1/2 stick) butter”, but I think that should be “1/2 cup (1 stick) butter”. I went with the larger amount (who wouldn’t? 🙂 ) and it turned out perfectly. You are right Avi! Thanks for pointing it out. I’ve corrected it. I’m glad it came out great for you.